When I was a kid I often stayed with my aunt Dottie when my parents were out of town or just to spend time with her. She was widowed relatively young and had no children. I was an only child, and she often seemed more like a grandmother to me than she did simply my father's aunt. She loved to read, and I have many happy memories of the two of us on the back porch in summertime, reading out books and sipping chilled lemonade. Those truly were the halcyon days of my childhood. Aunt Dottie had a huge collection of children's books -- her own books from childhood -- and she encouraged me to read them. I was always careful with books, and she trusted me not to damage them. She had a particularly fine collection of juvenile mysteries -- Nancy Drew, the Hardy Boys, Judy Bolton, Trixie Belden, the Dana Girls, Cherry Ames, Vicki Barr, among others. I read them all. Aunt Dottie's particular favorites, though, were the Veronica Thane books by Electra Barnes Cartwright. I still remember the thrill of opening the first book in the series, The Mystery at Spellwood Mansion, and being drawn immediately into the story. I raced my way through the rest of the series, then reread them a couple of times in the years that followed. Aunt Dottie left me her wonderful collection of these books along with her house, and when the Athena Public Library decided to do an exhibit on these classic children's books for National Library Week, I was thrilled. I need to go through the books and choose the ones for the exhibit. That's going to be a lot of fun -- if I don't get too distracted and start reading them instead of packing them in a box! Diesel would like that, of course -- he snuggles up to me (sometimes on me) while I read, and he also likes investigating the boxes. It's going to be a fun afternoon. In The Silence of the Library, available on January 28th in both print and e-book, Charlie relates what happens with the library's plans for the exhibit. Excitement builds when they discover that Electra Barnes Cartwright is about to turn a hundred and lives in seclusion nearby. What will happen if the beloved author makes an appearance at the library? 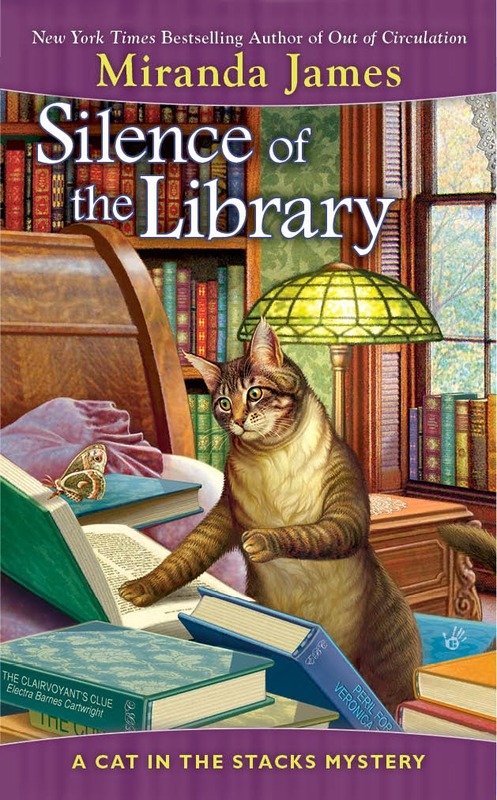 Looking forward to the new Cat in the Stacks mystery. I already have it pre ordered on Amazon. Reading was always a passion of mine, as a child. I, too, read Trixie Belden, Ginny Gordon, Nancy Drew, Boxcar Children and even the Bobbsey Twin books had mysteries in them. Later, I read all the Sherlock Holmes books. I see that Diesel is, as always, a big help! Before I got hooked on "grown-up" mysteries, I remember taking The Three Investigators out of the school library. A fictionalized Alfred Hitchcock sent them out to solve mysteries, which always appeared to involve something supernatural--but always proved to be merely criminal. Love those books. But anyway...is Electra Barnes Cartwright based on a real mystery author? I read all the Trixie Beldon and Bobbsey Twin books when I was young too. Love the Cat in the Stacks mysteries and look forward to the new book. Sorry for the lateness of this response; was out of town for a few days with spotty internet.I loved the Three Investigators too! Electra Barnes Cartwright is slightly based on Mildred Wirt Benson and Margaret Sutton, both of whom lived to be almost 100.